I have purchased at least 8 vehicles from this dealership including 5 Tacomas. I continue to use them because of the value they bring to the table. They have always done a great job satisfying my wants. I like the Toyota product and will go to Colonial every time I am looking for a vehicle for myself. Mr. McMahan, Kudas to Alshaham,Vlad,John and Cici. Because of their stellar customer service skills, I'll be a loyal customer. Although there is a Toyota dealership in my town, I travelled 20 miles on a friend's recommendation to meet Frank Pratts. After visiting several different dealerships and driving many different makes and models in my search for a new car, Frank knew exactly what I needed. He recommended the Toyota Highlander and he was right on target. He is informative, knowledgable ... and very easy to work with. He is accommodating and offers top notch customer service even after the papers are signed and you leave the lot in your new car. I highly recommend visiting Frank and Colonial Toyota in Milford if you are looking for a car - you will not be disappointed! First time I've owned a Prius, first time I've dealt with a dealership in 30 years. Michael Fournier in the Service Department, in fact everyone I've dealt with in the Service Department, was friendly, professional and competent. I asked for a few "extra things" during my oil change/Simoniz GlassCoat service call and all were satisfied with a smile. Dear Justin, I just wanted to thank you so much for the attention you gave to my headlight issue last week. Andy kept the car for three nights to get the adjustment right, and there is an immense improvement to the visibility issue. Please thank him for me. Mark also kept me informed along the way. I am very impressed with the way you handled this issue, and can say ... without hesitation, that you have created a loyal customer in me, by this show of action. I work in sales (tug boats), and I know that if my staff handled each situation the way you did, we'd be one of the best tug boat companies around. Please thank Mr. Crabtree for instilling this professionalism and concern into his staff, and thank you again for such a great customer service experience. Welcome to Colonial Toyota. Our team of experts are here to help you. Whether you are looking for your dream car or simply need automotive repair or financing, you can count on the Colonial Toyota team. We are a family owned and operated dealership that has been a fixture in the Milford, CT, community since 1982. Our customers come from all over the area to see us, including Southport, Westport, Weston, Strafford, New Haven, Greenwich and Orange, CT. Truly, you would be hard-pressed to find a larger selection of new, use and pre-owned Toyota vehicles in the area. Here you will find all of the newest vehicles from Toyota, including the RAV4, Camry, Corolla, Tacoma and Highlander. We also carry a variety of used vehicles in many different makes and models. Need quality automotive repair? Our team of Toyota factory trained and certified service technicians can help! Come see for yourself why drivers from all over the area continue to choose Colonial Toyota for all their automotive needs today! 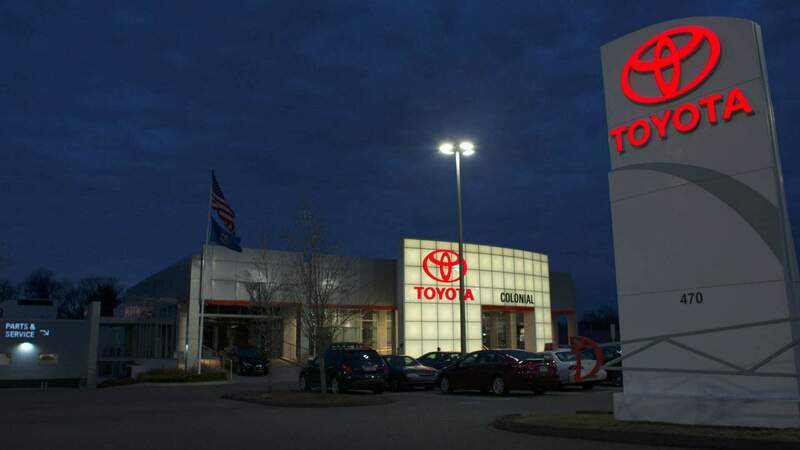 Here at Colonial Toyota, we are committed to creating a unique car buying and servicing experience, focused entirely on exceeding our customers' expectations. Our philosophy is simple; provide our customers with a No Haggle, One Associate approach to pricing vehicles, servicing vehicles, accessories, and financing.